In response to the hippies over at the NSIDC I announce the formation of the Non-National Snow and Ice Data Centre (NNSIDC). The operational mission of the NNSIDC is to claim the Polar Opposite of whatever the NSIDC is claiming. We kick off with NSIDC's Alarmist December 7th 2009 report concerning arctic sea ice conditions in November 2009. As chairman and sole member of the NNSIDC, I have rewriten the NSIDC report almost word for word, but removing all the fear to create a less biased report. In November, the average rate of Arctic sea ice growth defied manmade global warming fears by growing rapidly faster than normal, threatening the all too real possibility of an ice age. Possibly by May. However, at the end of the month, some regions, in particular the Barents Sea and Hudson Bay...it was about this time that ClimateGate happened! Have you seen the emails? Whistleblown from warmist computers! Can you believe it? The science is all based on a lie! Anyway back to the arctic ice situation. Arctic sea ice extent averaged over November 2009 was 10.26 million square kilometers (3.96 million square miles). This was 420,000 square kilometers (160,000 square miles) above November 2006. In general, the ice edge is now largely beyond its average location. So much for global warming. By November, much of the Arctic is in complete or near complete darkness. Air temperatures fall dramatically and sea ice grows rapidly. This is worryingly similar to what happens at the onset of an ice age. During November 2009, extent grew at an average 82,000 square kilometers per day (32,000 square miles per day). The rate of increase in sea ice extent has accelerated at an alarming pace! If this keeps up for another year the whole world will be covered in ice. In November 2009 emails and data were whistleblown to produce ClimateGate. Past years did not see this happen. Both Hudson Bay and the Barents Sea have experienced a freeze-up this fall. However, the rate of sea ice growth in the two regions probably resulted from different processes, highlighting the complex interactions between the sea ice, atmosphere and ocean. In the Barents Sea, the rate of ice growth was affected by winds that pushed the ice northwards into the very cold central Arctic, while temperatures contributed to the rate of ice growth in Hudson Bay. The Barents Sea is the deepest of the Arctic coastal seas. It is open on its southern and northern boundaries, allowing winds and currents to move sea ice in and out of the region. In November, southerly winds built up between an area of high pressure over Siberia and low pressure in the northern Atlantic Ocean, in accordance with Buys Ballot's Law. The winds transported air and water from the south, and pushed the ice edge out of the Barents Sea. according to a new analysis of peer-reviewed literature by the Hudson Institute. first published by the Seattle-based Discovery Institute. "Darwinists continue to claim that no serious scientists doubt the theory and yet here are 500 scientists who are willing to make public their skepticism about the theory"
"This data and the list of scientists make a mockery of recent claims that a scientific consensus blames humans as the primary cause of global temperature increases since 1850"
Did The Genesis Flood cause the Ice Age? As always, please note I never totally commit myself to any specific scientific research in case it turns out wrong. I only reference it to sow doubt about manmade global warming and co2. If it does turn out to be wrong then I expect to be able to move onto the next argument with an untarnished reputation. Thanks. "Evidence is also found in northern Europe, northwest Asia, many of the large mountain ranges of Eurasia, and high mountainous areas of the Southern Hemisphere and tropics. But the truth is, scientists still do not know the cause of the Ice Age as succinctly stated by David Alt: “Although theories abound, no one really knows what causes ice ages.” Uniformitarianism has not been able to explain the Ice Age, or events related to the Ice Age. Ice sheets are not developing and melting today so we have no way to actually observe how they developed in the past." Very interesting, just what I wanted to hear. If we can't explain the ice ages then how can we know co2 causes warming? "In summary, the Flood and its aftershocks provide the volcanic dust and gases that bring the summer cooling indispensable for the Ice Age. Water from the “fountains of the great deep” and mixing during the Flood provides a warm ocean. In the mid and high latitudes the warm ocean would cause copious evaporation and produce massive amounts of snow. The two ingredients required for an Ice Age, cool temperatures and tons of snow, were dramatically fulfilled immediately after the Genesis flood. This unique climate would persist for hundreds of years after the Flood as the intensity of the two mechanisms slowly decreased." This is the kind of science that should be published in climate journals, discussed openly and frequently at scientific meetings, etc. It should also be taught in schools as children are by far the most innocent and impartial judges of good science. It goes without saying that this science should be mentioned in the IPCC reports too. But you won't find any of this in the biased IPCC reports or in scientific journals becauce The Team have made sure that any views that dissent from Al Gore's do not get published. Please go and read the article in detail, it looks like the Bible explains climate better than the IPCC. Al Gore thought he was literally God, but now the shoe is on the other foot. 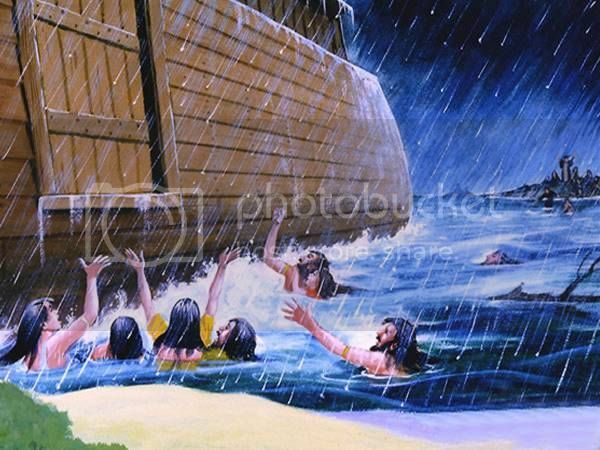 The sad state of science today is that journal editors that even dare to publish the scientific evidence that the Geneis Flood caused the Ice Age, let alone that the Genesis Flood was caused by God, would be thrown into a prison by UN thugs. Shouldn't science be fair to all opinions? Shouldn't it be possible to get any idea published without some subjective view of what is "correct" and "incorrect"? I can't see either of these papers being in the next IPCC report. Kevin and I will keep them out somehow - even if we have to redefine what the peer-review literature is! Thus all of the "science" done over the 20th century is now in doubt until blog scientists are given all the data to audit and confirm it. I only hope the Theory Of Flight survives auditing so that airplanes the world over can continue fertilizing the atmosphere with necessary levels of Life. Levels of life are currently at a dangerously low 380ppm. Hopefully this information will make it into the next NIPCC report or Professor Monkton will have a word to say about it. I was thinking. If Al Gore is so concerned about manmade global warming, shouldn't he have lost some weight by now from all the stress? So it turns out that Al Gore being fat is a strong argument against manmade global warming. An argument which to my mind the IPCC hasn't even bothered to address. The mainstream media won't even talk about Al Gore's weight. I guess the powers that be deem it an inconvenient truth. I have to rely on blogs for all my news these days. Did you know 877 new snowfall records set or tied in the USA in the last week? I read that on the internet. November was also quite cold. If you for one second doubted that ClimateGate has thrown into doubt all of 19th and 20th century "science" then read the following article from the world renowned Discovery Institute. The Discovery Institute is renowned in the field of Biology just as the Heartland Institute is renowned in the field of Climate. 2010 will be the first year of post-"enlightenment" thinking. So-called "scientists" and "experts" in their screwly little "peer review journals" are now a quaint curiousity of the past. Sure they will continue functioning in their own irrelevant way, but they no longer hold the type of "knowledge" politicians or ordinary people care to use to any practical end. Knowledge is finally now in the eye of the beholder, it is utterly down to our vision - how we percieve it. As the Discovery Institute puts it in their catchline, we will "Make a Positive Vision of the Future Practical". I know Christmas is a time of year where it is especially easy to lapse into bad habits, but please remember to regularly synchronize your thoughts with Think-Tanks in the relevant domain. Your blog scientists will keep you up-to-date with this information. Not only is Copenhagen a busted flush, we now have Top Players on the job finding new evidence against the sham of manmade global warming. "I conducted an ... poll among work colleagues, among neighbours, among Councillors, and among people attending a Christmas party... Whilst all acknowledged that the earth may be warming, I did not find a single person who believed the CO2 causality. Of these people a very high proportion were successful doctors, solicitors, consultants, and scientists." In a moment of Christmas party intoxication these professionals have voiced their true opinions. This is obviously a death blow for climate "science". When Solicitors don't believe a scientific theory you know it's days are numbered. We still have work to do though when people "acknowledge that the earth may be warming". This shouldn't be, they should be skeptical of everything. On the subject of the truth-serum alcohol, could the Heartland Institute not put on a Climate Science Beer Festival and invite the whole Manmade Global Warming Team? (only 10 scientists wrote the IPCC report, the rest were just watching). Get them drunk and the beans will be spilled. The image below is, in my opinion, one of the most disquieting images ever presented at Denial Depot. In my last post I observed the fraudulent state of climate "science" computer code. As part of the continuing exercise to discredit scientists I have also been flicking through Station Temperature records looking for anything suspicious. This suggests that Scientists have been fabricating station names all along. 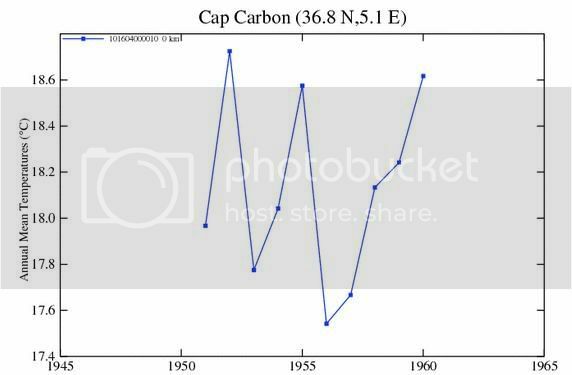 This pratice has only been exposed because, perhaps in a lapse of concentration, a scientist wrote their political objective to "Cap Carbon" on the graph instead fabricating a realistic station name. Then again I prefer to imagine the person who did this was a whistleblower. A whistleblower who became fed up with the fake science of manmade global warming and decided to expose the whole charade. Perhaps Keith Briffa again? We must now doubt all temperature station names until we can be sure the locations actually exist. Why hasn't the IPCC checked this? So it seems NoHopeInHellHagen has to be called off again. Manmade global warming is based on nothing more than a lie. The side bar is a feature I use to teach my readers the "dos" and "donts" of science. The previous sidebar covered the team "science" practice of lazily using so-called "exponentials" rather than writing numbers out in their true virgin form. In this sidebar I want to look at plotting data - what is plotting data and what does it mean for science? Plotting data is a form of data adjustment and is therefore inherently wrong according to the "keep it pure, keep it raw" data doctrine of Blog Science. Data should always be presented in it's true tabular form, not "adjusted" into an arbitary graphical format simply for viewing pleasure. It's scientifically improper and even slightly amoral to sit there watching images of data. The IPCC of course have no moral or scientific qualms and so rely heavily on graphs to "prove" global warming. If the public just saw the numbers in a table they wouldn't notice any manmade warming at all, just a load of natural numbers. The alarmist IPCC cannot stand this fact and so they adjust temperature data into graphical format. With a line here and a line there the IPCC know that data can be made to say anything using graphs. Garbage In Garbage Out. I have uncovered breathtaking fraud! Not merely a smoking gun more like a smoking ICBM! Before revealing this I need to point out that in a previous post I may have implied that NASA had faked the recent CRU email leak. While I don't believe in correcting posts (blog scientists should never modify recorded data), I would like to point out that NASA didn't fake the CRU email leak afterall. That's right, NASA merely tricked me into accusing them of an elaborate hoax. Just as they once tricked me into accusing them of faking the moon landing. Well it wasn't just emails that were leaked - computer code was leaked too and I have uncovered fraud! First some background. In the 1980s everything was going swimmingly for the so-called "scientists". They had their fine ivory rooms in their collosal ivory towers, they had their grant money delivered in huge money buckets and access to all the finest fancy restaurants in Hollywood. But then they made a fatal mistake. Probably sometime between the Olivetti and the Amiga one of them thought "hmm all this calculating by hand is rather tiresome...lets trying programming it into a computer instead." And so fate viciously unfolded. By merely typing a single line of computer code and pressing enter they instantly and unwittingly handed me the keys to the kingdom. Immediately they provided me the expertize to understand and assess all of climate science armed only with my deep knowledge of Visual Basic 5.0 which I gleaned from a two year stint with a temping agency. Realizing their mistake the so-called "scientists" clamoured over desks and drawers to shut down links with the outside world. All the source code was placed deep inside the CRU computer (sort of looks like the last scene in raiders of the lost arc) where they thought noone would think of looking. And they were right...until now. NASA blame a hacker. I find it more convenient to believe a whistleblower did it. I think it was Al Gore. But anyway the important fact is the code is free! To non-programmers it is just cryptic symbols. But to my trained programming eyes all the symbols align into dazzling shapes and images. It all fell together. I couldn't believe it. All this time I had trusted these scientists on this very important issue! Honestly I had. Remember? But now that trust was broken. I had to report my discovery to the public as a matter of urgently. And so here I am. You see fortunately they put comments into the code in case at a later date they forgot they were committing fraud. That proves it! It's fraud! What are the implications of this? Well we can no longer be sure that co2 as a molecule even exists. Manmade global warming is proven to be a complete farce simply invented as an excuse for taxes. NoHopeInHellHagen will have to be cancelled and taxation will have to be wiped out completely. This will require a complete shake up of the financial system. Governments will crumble, there will probably be wars. Maybe we will have to live on the moon afterall. I did warn them of this! This also casts severe doubt on knowledge in general. Are we really here? Are we just brains in jars?